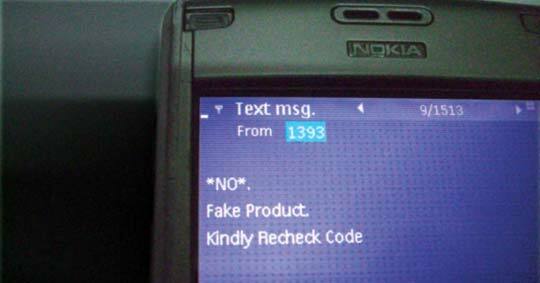 After consumers send a cell phone text message with the numeric code listed on the drug, they receive a text message identifying the product as fake (as shown) or authentic. When patients go to a drugstore to pick up medicine, they expect it to be authentic and to manage or resolve a health condition. But what if that prescription was fake, a counterfeit drug that could cost them their health, or even their life? That is a critical concern for many patients outside of the United States, said Ashifi Gogo ’05, a graduate engineering student at Dartmouth College. He is co-founder of mPedigree, a nonprofit organization working to protect the prescription drug supply chain in West Africa through cell phone technology he helped develop. The World Health Organization calls counterfeit medicines “an enormous public health challenge.” Counterfeit drug sales are projected to reach $75 billion globally by 2010, an increase of more than 90 percent from 2005. “Some of the counterfeit medicines don’t contain anything; it might be cornstarch pressed into a pill,” Gogo said. “Other medicines may contain too much or not enough of an active ingredient.” The worst-case scenario is a counterfeit that contains deadly toxins. Existing technology can help identify counterfeit drugs, but all the “techno-centric” methods tend to be either too high-tech for a developing nation — Radio Frequency Identification (RFID) tags and nanoparticle embedding, for example — or provide too little protection, Gogo said. The identification method developed by Gogo and his classmate from Ghana is simple, cheap to implement and effective. Gogo explained it like this: “Lottery ticket-type numeric codes are placed on the drug’s packaging. When you buy the drug, you scratch the panel and see a string of 13 digits. In Ghana, it’s very simple. You just send a free cell phone text message with the information to a four-digit number — 1393, very easy to remember. You get an instant response to indicate if the drug is genuine or fake while you are at the pharmacy. 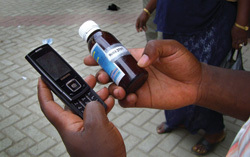 If the drug is fake, you can query the pharmacist and keep testing drugs until you get an authentic medication or take the matter up with law enforcement agencies, armed with factual evidence of counterfeit medication.” This method is viable because cell phones are plentiful in Ghana, he noted. A trial run of mPedigree’s authentication method in that country in the first quarter of the year was successful, and the project will be launched with local drug manufacturers this winter. While mPedigree implements this technology, it also works to amend laws. “We’ve had initial success,” Gogo said. “The Ghanaian law enforcement agency created a special unit for counterfeit issues and is working on moving counterfeit activities to the same punitive level as narcotics,” he said. “Just a few months ago, the Ghanaian FDA organized the nation’s first anti-counterfeit conference, inviting notable West African health experts, such as Professor Dora Akunyili, who survived an assassination attempt linked to her efforts to rid Nigeria of fake drugs. As Gogo travels back and forth between African countries, personal security is paramount. However, the risk hasn’t slowed him down. He continues his work with legitimate drug manufacturers in Africa and his studies at Dartmouth. Through the engineering school’s Innovation Program, Gogo receives entrepreneurial training and the theoretical and technical expertise he needs to keep his drug authentication initiative moving forward. That something, it appears, is helping to secure the pharmaceutical supply chain of West Africa. 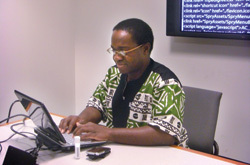 Editor’s note: To listen to a recent BBC World Service radio interview with Ashifi Gogo, visit the mPedigree Web site.